Have you ever been stuck in traffic on State Route 65 and noticed your ride was a bit bumpy? It’s been a while since these roads have been repaired due to a lack of state funding available to properly maintain existing roads and highways. But in just a few weeks you will see some work being done on SR 65 between I-80 and Lincoln Boulevard! Recently, Caltrans awarded funding for a small portion of State Route 65 to be repaved. The work will take about 3-4 weeks to complete. But let’s be clear. While PCTPA recognizes and appreciates Caltrans’ investment in repaving this portion of SR 65, it does not address the highway’s main problem: traffic congestion. SR 65 is currently experiencing operational problems during peak morning and evening commute times, and average speeds and travel times on these roads will only get worse as growth increases in our region. 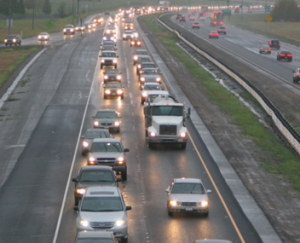 As more employers come to Placer County, more families will find themselves stuck in traffic if we do not plan ahead. The repaving work by Caltrans is not redundant with PCTPA’s overall plans for SR 65, but it leaves much to be desired. PCTPA’s SR 65 Widening Project proposes improvements to relieve congestion, improve operations, and enhance safety to the freeway from north of Galleria Boulevard/Stanford Ranch Road to Lincoln Boulevard. These improvements include widening the highway from 2 to 5 lanes in each direction with mixed-flow lanes and auxiliary lanes between interchanges to ease the flow of traffic. Currently this project is not funded and PCTPA, the County of Placer and the cities of Roseville, Rocklin and Lincoln are exploring strategies to fund this and other critical transportation projects. You can learn more about the draft Comprehensive Transportation Plan PCTPA has developed at www.KeepPlacerMoving.com. In the meantime, enjoy a smoother ride on SR 65 between I-80 and Lincoln!